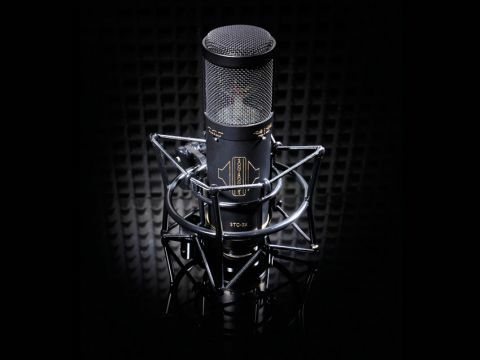 A fantastic mic for vocals and very much a suitable all-rounder at this price point. Omni pattern available as well as cardioid. Pad and roll-off switches add versatility. Solid construction. At this price point, not much. Sontronics' original STC-2 large-diaphragm mic, introduced five years ago, has been a huge seller for them. The company, however, was aware that there was a gap in their catalogue between the STC-2 and the multi-pattern Orpheus and, rather than design an entirely new mic, they took the STC-2 as a basis and built in some extra features to create the similar sounding but more versatile STC-2X. The main differences are that the STC-2X offers omni pickup pattern as well as the standard cardioid, adds a -20dB pad to the existing -10dB one and offers two options for bass roll-off, with attenuation from 150Hz as well as 80Hz. Available in either black or silver, the STC-2X comes complete with a suspension cradle in a foam-lined aluminium carry case. Build quality is of a high standard and the mic is reassuringly weighty although not so heavy that it causes its suspension cradle to sag on the mic stand. An easily turned lever locks the cradle solidly in position at whatever angle you desire making positioning straightforward. The one-inch gold-sputtered capsule can be clearly seen through the mesh grille that is finely patterned while still feeling hard-wearing and protective. We guess that most users would be buying the STC-2X mainly for recording vocals and the feeling is that they would not be disappointed. After cardioid, we'd take an educated guess that omni is the pattern most users would want - there are likely to be occasions when capturing sound from all around is desirable even in the smallest home studio. One obvious musical use would be in grouping backing vocalists around the mic but it may be that you wish to capture a single instrument with a wider sense of ambience than using cardioid would impart and the STC-2X takes care of this in style. It's also ideal if you have occasion to record a round table conference, a small acoustic ensemble (assuming mono will work in your project) or even a full band rehearsal from the centre of a room. OK, most observers would tell you that if you have a limited budget and are only going to buy one mic for your recordings then you should buy a large diaphragm condenser with a cardioid pattern as this will be ideal for recording vocals and suitable for acoustic guitar plus a variety of other tasks. A multi-pattern mic would be the more versatile option but at the same time more expensive, so perhaps just out of reach. Sontronics, though, have changed the game by offering the STC-2X as an alternative (and a step up) from the huge number of cardioid-only mics that are out there in the sub £200 price bracket. At a similar (or not-too-much-more-expensive) price you are getting a mic that can take care of all the cardioid action but also give you the omni option for those occasions where it would come in handy.